This old news clip features an interview with four, young Canadian women (one of whom is my mother-in-law, Shirley Rodwell: far right) in Trafalgar Square, London, in 1955. That Spring, they had graduated from University of Toronto, and seeking adventure, sailed from Toronto, Canada to London, eventually tracking down a retired, 1934 Austin, London taxi cab. Proudly covering it with Canadian maple leaves, and nick-naming her "Genevieve" after the popular film of the same name from 1953, they traveled around Europe for 4 months, and certainly found adventure along the way. The women are (from left to right during the main interview) Peggy, Dyanne, Ria and Shirley. I intended to make a documentary film about their story, but was not able to raise funding. Along the way, an 83-year-old man in Taos, New Mexico contacted me, when he heard I was working on "Taxi Girls" and interested in other, old London taxi stories. This man was, of course, Alfred Hobbs. I would like to dedicate all my efforts to Dyanne Gibson, one of the four women who made that incredible journey in 1955. Dyanne recently passed away very suddenly. If it weren't for Dyanne, Shirley, Peggy and Ria, I would not have been inspired to take my first steps toward documentary film making, and without their story, I would never have met Alfred Hobbs. He and I both owe much to the Taxi Girls, and to Dyanne. Thank you. Alfred & Jakobine, A Documentary Film: Path to the story from Jonathan Howells on Vimeo. For more images, please view this Flickr stream. In the summer of 1955, four 21-year old women from Toronto became a cause célèbre in Canada and Europe because of a very unusual journey. They sailed to Europe for a three month tour, with a plan to cross nine countries and over 6,000 km in a retired, 1934 London taxicab. With chance, determination, and support from friendly strangers, they did it, unsettling their families, charming Europeans, and capturing the attention of media on both sides of the Atlantic. 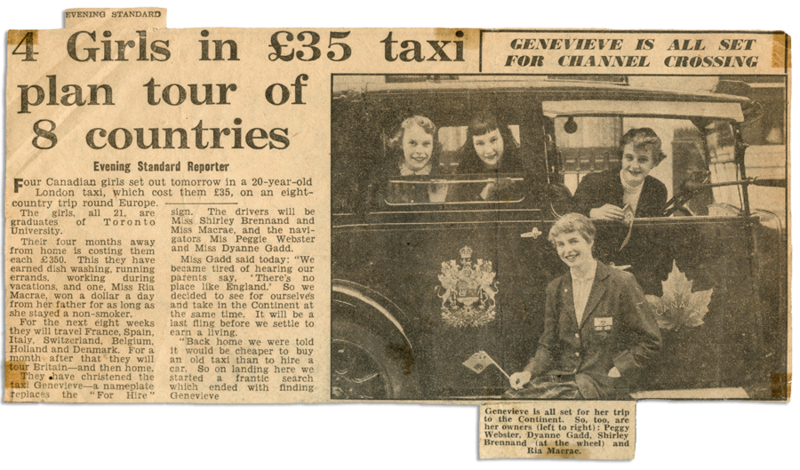 A Canadian television station broadcast an interview with the women in September of 1955, standing beside the taxi they christened “Genevieve” after a popular British film of the day, its doors decorated with a maple leaf insignia and Canadian coat of arms. Twenty articles (in The Globe and Mail, Toronto Star, Toronto Telegram, The Montreal Gazette, and a number of British and Scottish dailies) chronicled their progress. They roared through the summer, swinging between gritty scrapes on the road, scant seaside meals of bread and wine, and glittering evenings of cocktail chic in the capitals of the Continent. Locals waved and shouted from sidewalks, and young men chased them around the capitals of Europe. Dyanne, Peggy, Shirley and Ria (with Genevieve the taxi) became semi-celebrities. of the women who are now grandmothers. Taxi Girls will tell two parallel, road trip stories, with the same characters, but fifty years apart. The passage of time, change and our society’s attitudes toward older adults are central themes. We will see that in spite of our society’s misconceptions about aging and the old, four 72 year old women can surprise us all by reliving a youthful adventure with equal vitality, wanderlust and even greater insight. The film will strive to leave its audience with the impression that like many stereotypes, ageism is based on false and damaging misinformation. It will, however, confirm that change is inevitable and over the half century that has passed, we will see change not only within the women themselves, but also in the world they revisit.